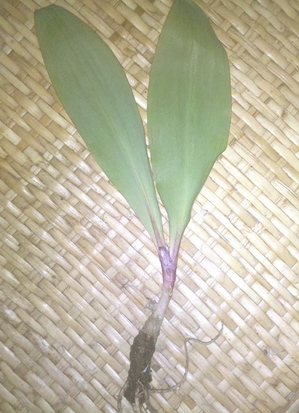 Posted on Mon, Apr 5, 2010 : 8:28 a.m.
A wild ramp showing its twin leaves and onion-like bulb. Along the banks of the Huron, in moist creek sides, where there is humus and wet, you may also find the spring delectable ramps, or wild leek Allium tricoccum. Mixed in with trout lilies and other wild flowers, the ramp has two leaves sprouting from a single small bulb just below the ground. The ramp is easy to harvest with a stick, a knife, or other digging tool, or just scratch the dirt away and gently pull to unearth this spring treat. The leaves are soft, the bulb is gentle, and the taste is mild and wild. I’ve only been harvesting ramps for a couple of years, and each year I’m surprised at their early arrival. The colorless leaves from last year’s trees will still be blanketing the woods, only a few wild flowers are up, spring still seems tentative, but the ramps signal that spring is solidly here. Which may be why this spring treasure is celebrated in festivals in Virginia as well as Pennsylvania. How can they be used? The entire plant is edible, once the root hairs at the very end have been cut off. Rinse off the dirt, and use it in a dish where onion or garlic would be added. The fresh uncooked flavor is the best, so added to scrambled eggs right at the end, mixed into a potato salad or bean dish, used on in salads, or added to a sandwich spread would work. They can also be cooked, used in soup, any place you might use leeks or onions. One of my all time favorite ways to use ramps is in pesto, combined with another spring green, yellow dock Rumex crispus leaves. In a food processor I combine about 2 parts yellow dock leaves to 1 part ramps, add enough olive oil to make a paste, and walnut or pine nuts - about Â¼ cup of nuts for 2-3 cups of greens. A little salt, and blend well. The pesto can be frozen as is in bags or tubs or enjoy over pasta or as a treat on crackers or even pizza. For years I enjoyed pesto made with yellow dock leaves made the traditional way with garlic. Substituting ramps for the garlic has turned what was a wonderful recipe into something absolutely transcendent. I make as much as possible and enjoy it from the freezer all year ‘round. I found that the ramps also lasted many months in the refrigerator if I was careful not to wash them before storing in a plastic bag. The very tender green leaves didn’t preserve well, but the bulb did and still had a great taste many months later when used as I would an onion in sautÃ©s and other dishes. The ramps will peak in about a week or two, I would guess, but will be around until sometime in May. But for the best flavor, harvest them while the paired green leaves are still tender and soft. This is a great wild treat. Ethical harvesting of ramps requires permission and selective harvesting. Don’t take more than a third of the plants in any area, and it is not allowed to harvest in city or county parks. Linda Diane Feldt is a Holistic Health Practitioner, teacher and writer. Her upcoming free class, sponsored by The People's Food Co-op, is on Assembling an Herbal First Aid Kit. Join us April 22nd, 7 pm at Crazy Wisdom Bookstore. You can follow her on twitter, or for more information check out her Web site. Her cookbook, Spinach and Beyond: Loving Life and Dark Green Leafy Vegetables, includes the pesto recipe, and is available locally and from Amazon.com. Mon, Apr 5, 2010 : 1:19 p.m. The Library of Congress has great information about the importance of ramps in Appalachia in the "Tending the Commons: Folklife and Landscape in Southern West Virginia" collection -- http://memory.loc.gov/ammem/collections/tending/index.html. Mon, Apr 5, 2010 : 9:54 a.m.
After publishing this, I was directed to a story about ramps and Rapunzel. http://www.traditionalhome.com/blog/2006/05/lkfs-little-known-facts.html Apparently ramps are related to Campanula rapunculus, Rampion, which is the herb Rapunzel's mother craved while pregnant with here, and which got her into trouble. I had no idea. There is much more to the story, but that is a start.